Aroma: The aroma presents subtle notes of dried fruits and sweet, toasted breads, along with a base toffee, fresh honey and cartelized sugar. You can also appreciate a faint hint of almonds and vanilla. 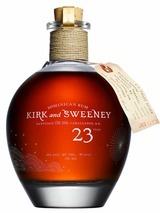 Taste:Having spent 23 years in the barrel, this rum is a pleasantly complex as the nose and aging would suggest, offering a rich evolution on the mouth from fresh, sweet sensations to dried fruits. Finish: Finishing off each decadent sip, you'll find endnotes that range from a distinct caramel, to sherry, to sherry, to a well balanced blend of almond and vanilla.